Please book your flights on time as Venice is the top world tourist destination. Please read **this information** before planning your transportation method and trip to Venice. The cruiser MSC Preziosa is both the venue and the place of accommodation for participants of the SDEWES2014 Conference. The MSC Preziosa is a part of the MSC Cruises fleet. MSC Cruises is a leader in the Mediterranean cruise market, sailing in the region throughout the year, as well as offering a wide range of seasonal itineraries in Northern Europe, the Atlantic Ocean, Caribbean and the Antilles, South America, South Africa, the Canary Islands, and The United Arab Emirates. At the moment all the cabins that were offered through our booking agent BIZZ Travel are sold. If you still would like to attend the SDEWES2014 Conference we advise you to inquire your local tourist agencies specialised in cruises about available cabins (prior paying your Conference fee). 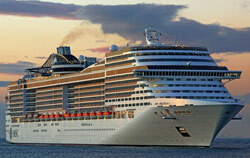 Also you can check with MSC Cruises which are those agencies in your area: http://www.msccruises.com/. Dinner is served in the restaurants in two sittings. All SDEWES2014 participants and their accompanying persons are under a same SDEWES group code which has a later dinner (sitting) at 20:45h at Golden Lobster restaurant. However, for lunch participants can choose to eat in any restaurant. Here you can see a list of all restaurants on board of MSC Preziosa: http://www.msccruisesusa.com/us_en/Ships/MSC-Preziosa/Restaurant.aspx. To contact BIZZ travel agency please write to sdewes2014@bizztravel.biz. Please consult Bizztravel's Terms and Conditions and Useful information. Double bed can be converted into two single beds. Air conditioning, bathroom with shower, interactive TV, telephone, availability of internet connection by your own laptop (on payment), mini bar, safe deposit box. For a virtual tour of the room, please visit here. Air conditioning, spacious wardrobe, bathroom with shower or bathtub, interactive TV, telephone, availability of internet connection by your own laptop (on payment), mini bar, safe deposit box. MSC Preziosa is Fantasia-class cruise ship owned and operated by MSC Cruises. She entered service in March, 2013. The ship is 333.3 meters in length and is 38 meters in width. It can travel at a speed of up to 23.7 knots (43.9 km/h; 27.3 mph). With 1739 staterooms, she has over 100 more staterooms than her sister ships. Naval architect De Jorio Design International also introduced a completely redesigned deck, in addition to a new restaurant. The MSC Yacht Club has been enlarged. or the exclusive Ristorante Italia, where a seriously upscale menu is available every night. landings on the decks below. Vertigo was awarded the ‘Best Innovation’ by Cruise International in 2013. For more serene aquatic pleasures there’s a dreamy ‘infinity’ pool and, just so that the odd spot of inclement weather cannot spoil your fun, there’s even a retractable roof on one of the main pools. For sun-worshippers looking for peace and tranquillity the Top 18 area dedicates premium deck space and stunning sea views to adults who’ll appreciate its dedicated spa service, bar menu and complimentary fruit skewers. MSC Preziosa is suitable for up to 4.345 passengers that can choose various cabin types. Surface area is 450.000 m2, including 27.000 m2 public area on 18 decks. To explore groundplans of the ship please click here. For more information and photos of the ship please look here. As a leading member of the European Cruise Council (ECC) MSC Cruises has agreed to promote a transparent and sustainable cruise industry; to lead the development of uniform environmental standards; share lessons learned and good practices; to establish and maintain partnerships, co-operation and open constructive dialogue with relevant maritime authorities and other stakeholders; to encourage increased availability of appropriate reception and recycling facilities at major European ports, improve energy conservation, increase recycling and reduce waste. Find out more about MSC Cruises efforts to protect the environment on this link. Find our more on cities and countries we shall visit.